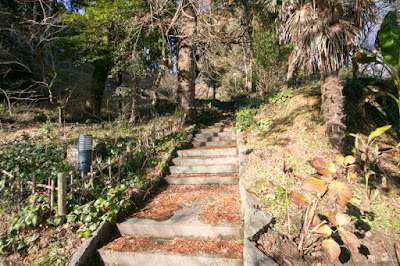 Nankan castle (南関城) is built over the Takanohara hill of about 50 meter height from hillside, at the north of current Nankan town office. 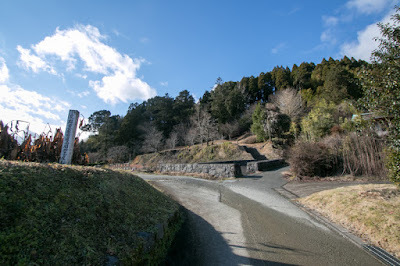 Nankan area is hilly area at the western end of Chikuhi mountains which separates Chikugo province and Higo province, and even now the border of Fukuoka prefecture and Kumamoto prefecture. 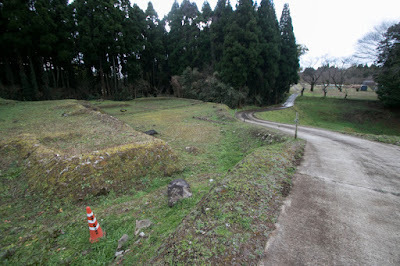 There are three roads connect Kurume city, the center of south half of Fukuoka prefecture and Kumamoto city. One is the eastern mountainous route passes Oguri toge pass used as current Route 3, and another is the center route passes gentle hill of Nankan area which is traced by Kyushu Jidoshado Expressway. The third is western coast road runs Omuta city and Arao city, which is the route of Route 208, 209 and Kyushu Honsen line. 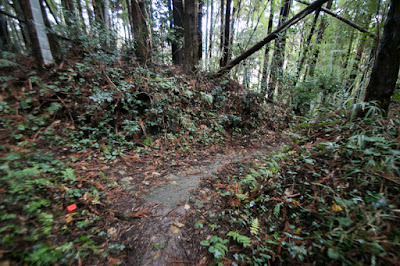 Among these three routes, eastern route was a tough mountainous route and not convenient in old age. 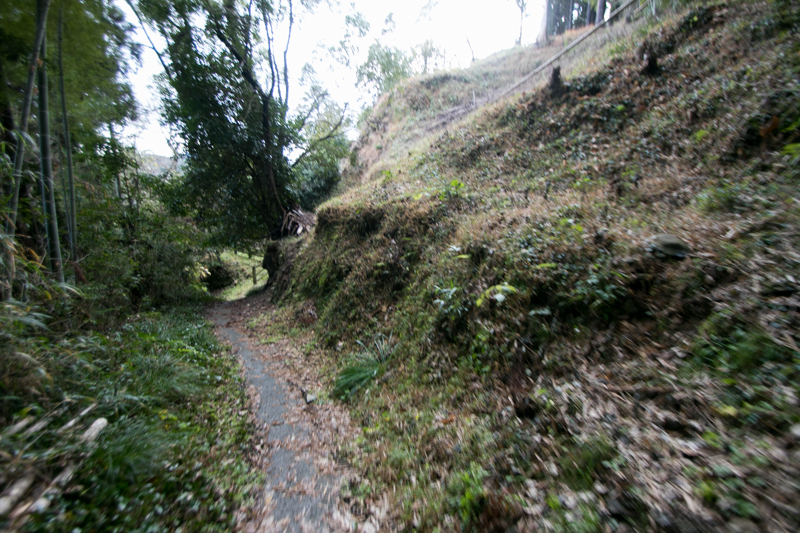 On the other hand, western route was a flat road runs through town thus convenient one, but is a long way round and affected by marshes. Compared with these roads, middle route is a linear route connected Fukuoka area and Kumamoto area in shortest distance with steady use. Ancient Yamato dynasty built Saikaido road passing Nankan area, and built Otsuyama barrier at this place. 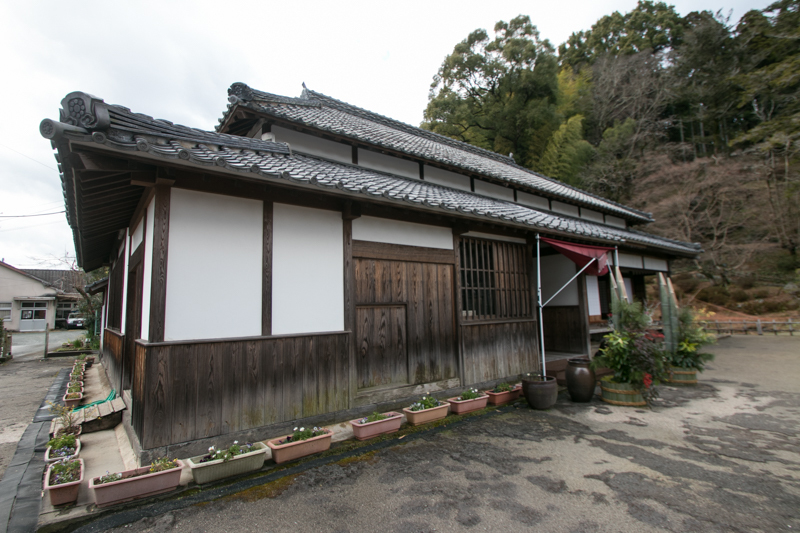 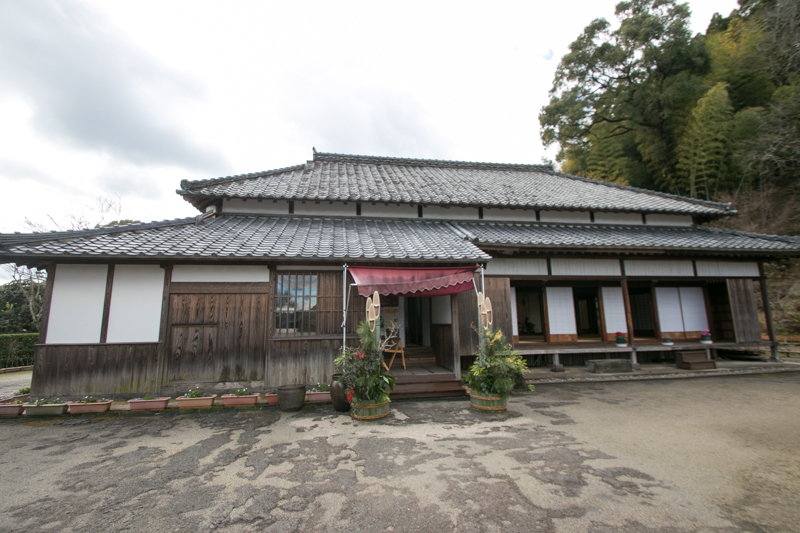 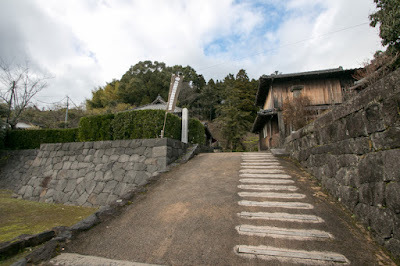 In medieval era, Nankan area was governed by Otsuyama clan which was said as a descendant of central noble Hino clan. 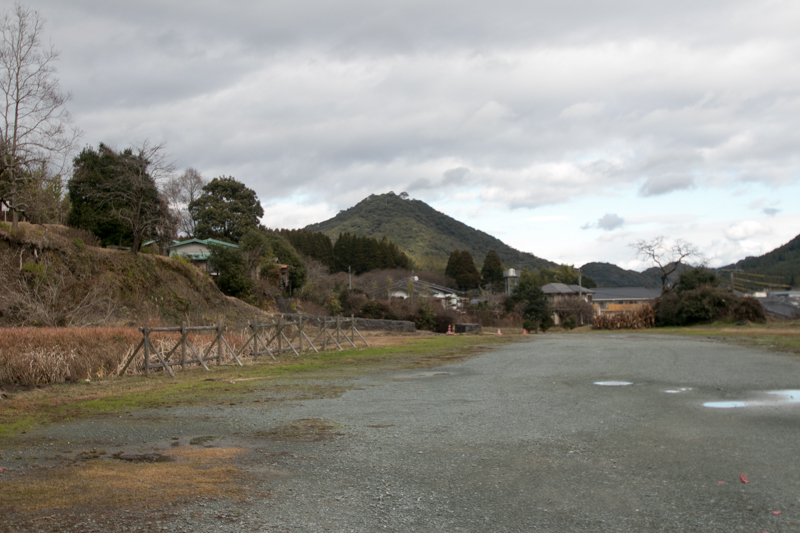 In the former half of 14th century person of Hino clan was appointed as the local lord of Otsuyama castle at the east of current Nankan interchange, then named themselves as Otsuyama clan. Same as other small lords of Higo province being surrounded by strong warlords, Otsuyama clan survived turbulent period changing their master from Otomo clan, the warlord of Bungo province (Oita prefecture), to Ryuzoji clan, the one of Hizen province (Saga prefecture) once established its hegemony at north part of Kyusyu island, or Shimazu clan at Satsuma province (Kagoshima prefecture) which beat Ryuzoji clan and approached to the unification of Kyushu island. When central ruler Hideyoshi Toyotomi (1537-1598) started Kyushu campaign to beat Shimazu clan and landed to Kyushu island, Otsuyama clan welcomed Hideyoshi and was approved as the local lord under Narimasa Sassa (1536?-1588), the general of Hideyoshi who was appointed as the governor of Higo province in 1587. But as Narimasa tried to deprive interest of Otsuyama clan, at that year Otsuyama clan raised rebellion with neighbor local lord such as Kumabe clan or Wani clan, and encircled Narimasa at their main base Kumamoto castle. 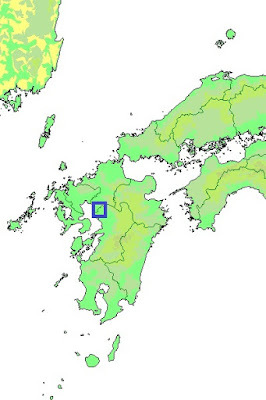 But the leader of Otsuyama clan was assassinated by Narimasa under his plot, and Otsuyama clan was extinguished. After the cease of rebellion Narimasa was also punished then Kiyomasa Kato (1562-1611), a distant relative of Hideyoshi and activated at the battle of Shizugatake in 1583, became the governor of north half of Higo province. 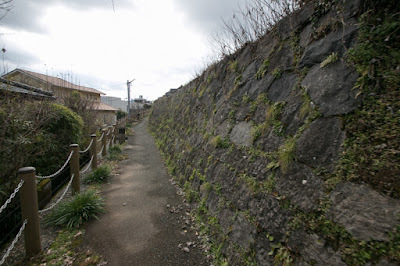 As a border castle toward central area, Kiyomasa placed his confident relative Masatsugu Kato (?-?) as the lord of Otsuyama castle. 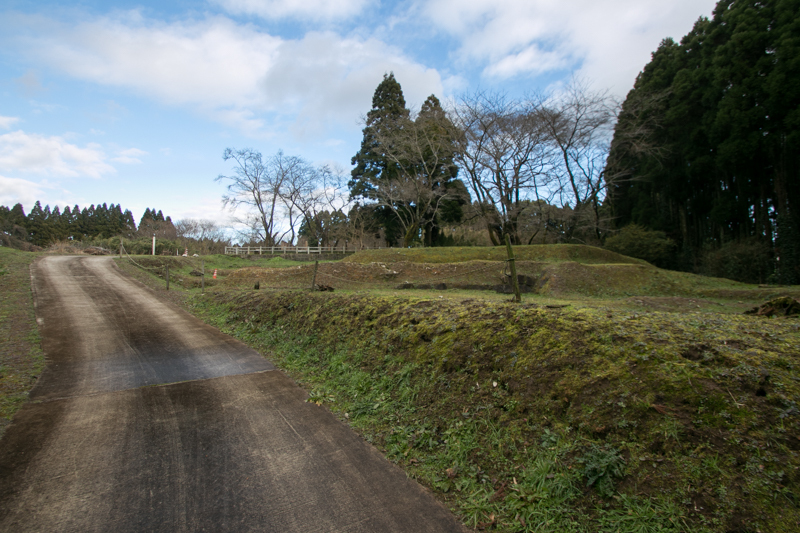 After the death of Hideyoshi, the battle of Sekigahara between Ieyasu Tokugawa (1543-1616), the largest lord of Toyotomi government, and Mitsunari Ishida (1560-1600), chief magistrate of Hideyoshi, occurred in 1600. Under the conflict of front generals and administrative staffs, Kiyomasa belonged to Ieyasu, and Ieyasu broke Mitsunari decisive battle of Sekigahara. 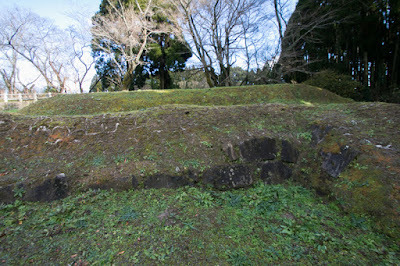 As a reward, Kiyomasa became the large lord which reigned whole part of Higo province. 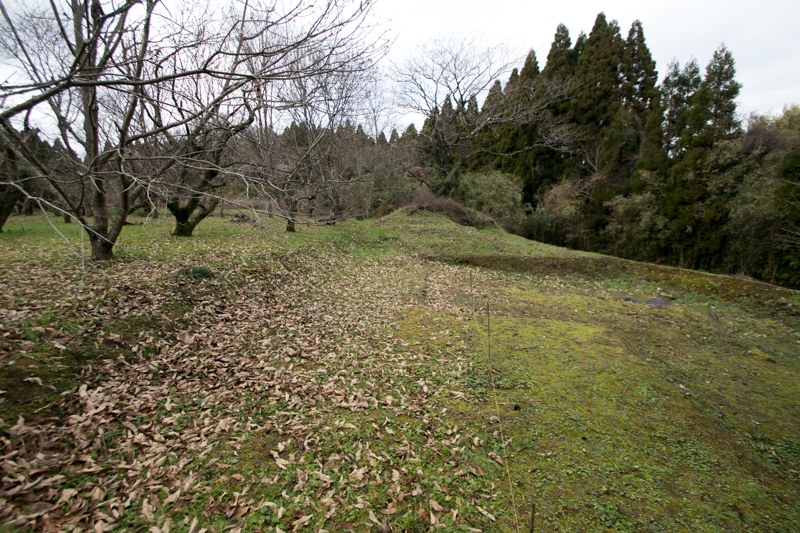 After the battle of Sekigahara, Kiyomasa renovated his main base Kumamoto castle into huge and secure fortress. 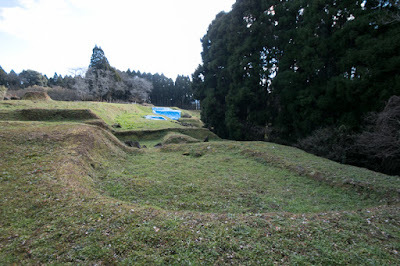 Additionally, Kiyomasa built branch castles such as Uto castle, Mugishima castle, Minamata castle or Sashiki castle at important place and border of his territory. 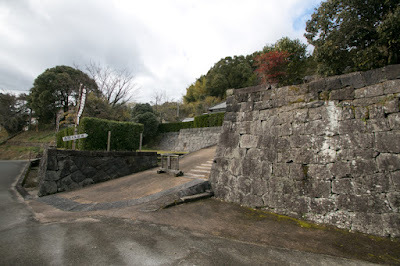 Once Ieyasu seized hegemony and opened Edo Shogunate in 1603, but Hideyori Toyotomi (1593-1615), the successor of Hideyoshi, still remained at Osaka castle and this was a cause of future conflict. 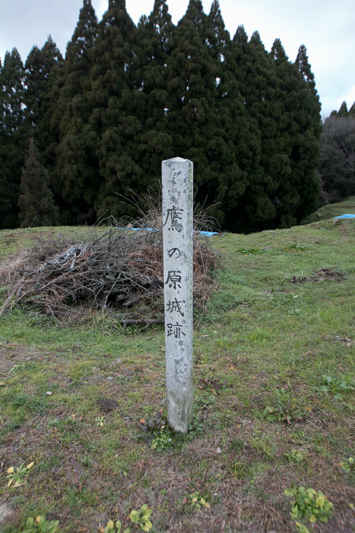 Especially Kiyomasa once supported Ieyasu under the conflict with Ieyasu, but still had a loyalty to Toyotomi clan. 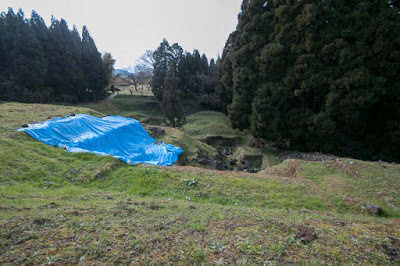 Kiyomasa arranged coordination between Edo Shogunate and Hideyori Toyotomi, and it is said that in case of emergency Kiyomasa planned to place Hideyori to his residence Kumamoto castle and make a battle against Edo Shogunate. 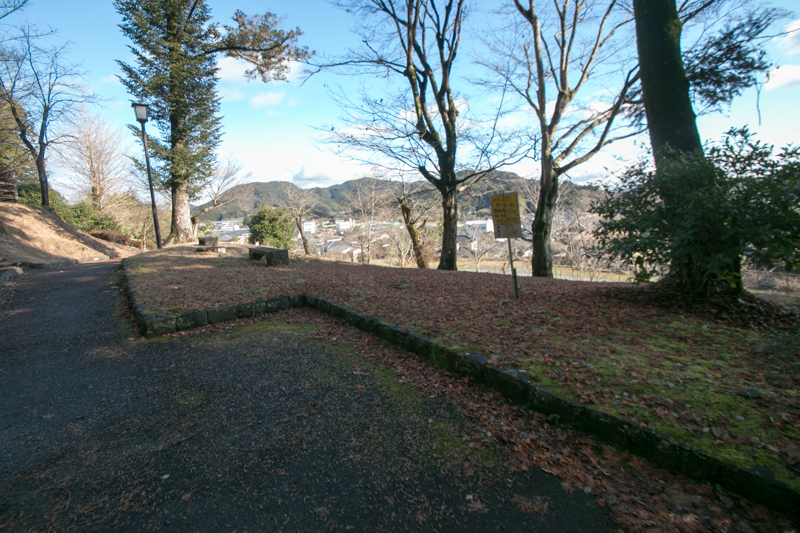 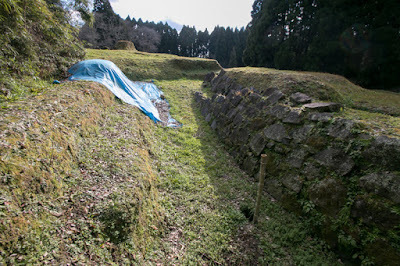 Apart from the truth of this story, Nankan area was an expected main front against central area, and Otsuyama castle was a secure castle built at beautiful corn shaped independent mountain but too small and not suitable for modern battle. 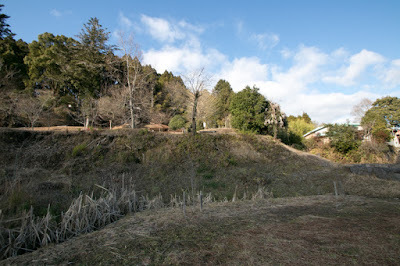 In 1601, Masatsugu Kato newly built Nankan castle at Tahanohara hill, under the planning of Kiyomasa. 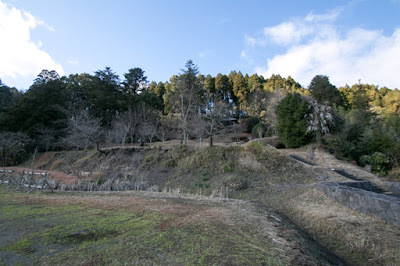 Nankan castle is built over a long and narrow height of 1 kilometer long and 150 meter width spreads east and west ward, being surrounded by sheer cliff. 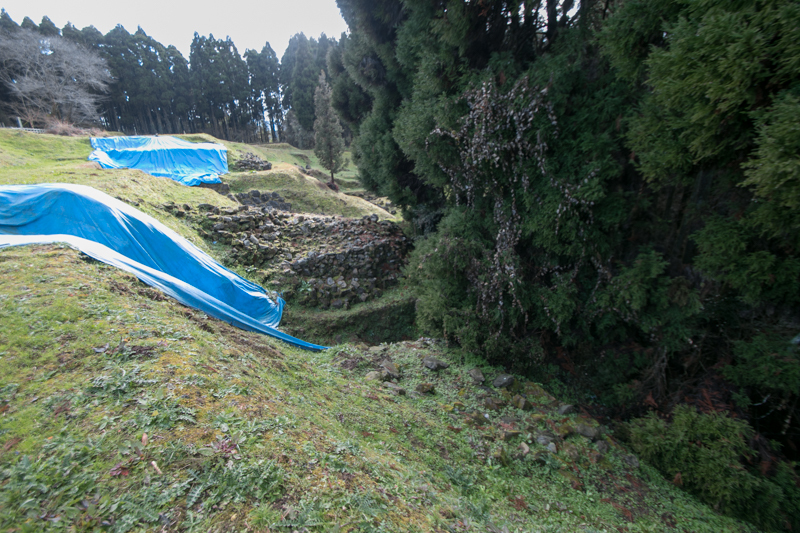 There is no detailed plan map except for some excavation report and it is difficult to grasp the precise shape, but the core part might be the central area at the top of the hill, secondary area at the north and third area at the west ahead of deep dry moat. 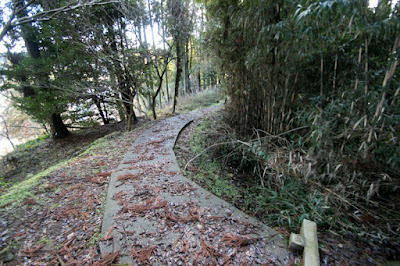 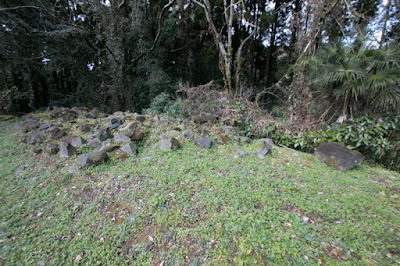 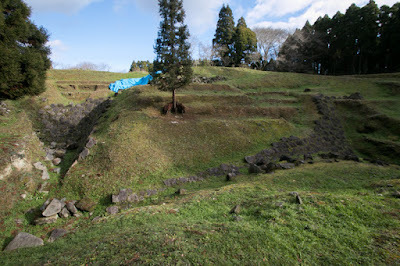 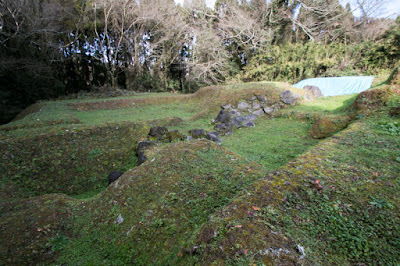 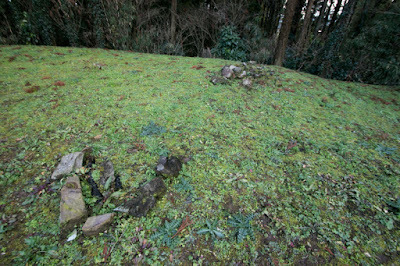 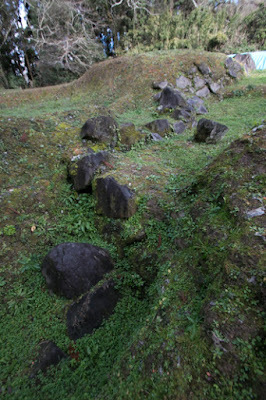 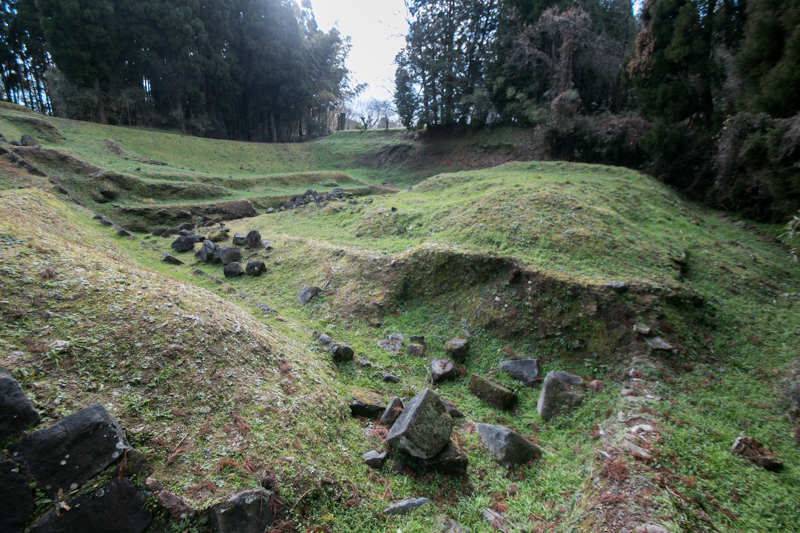 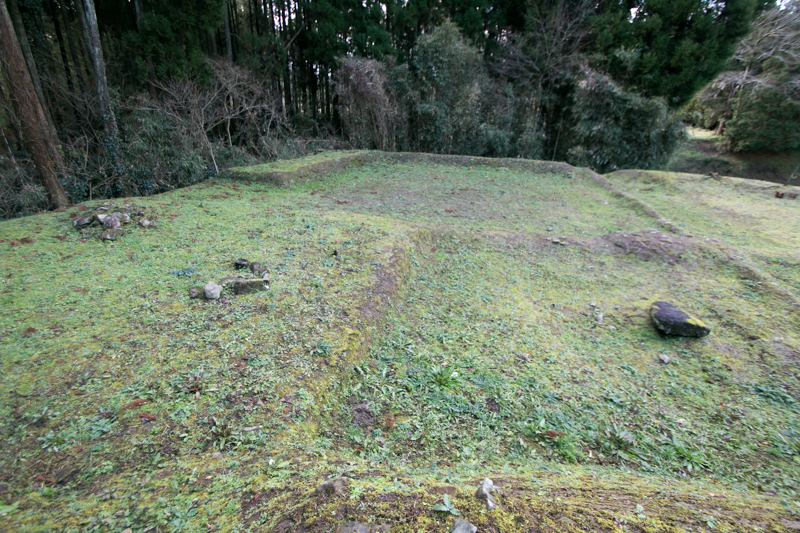 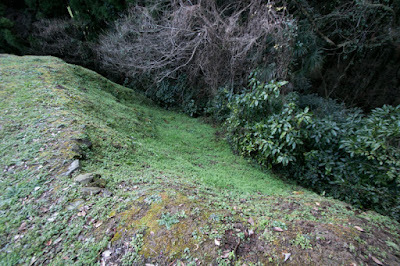 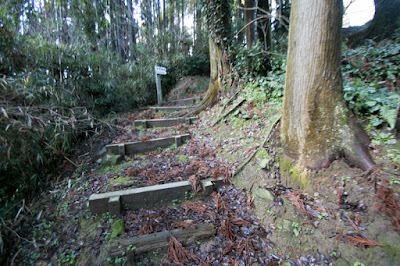 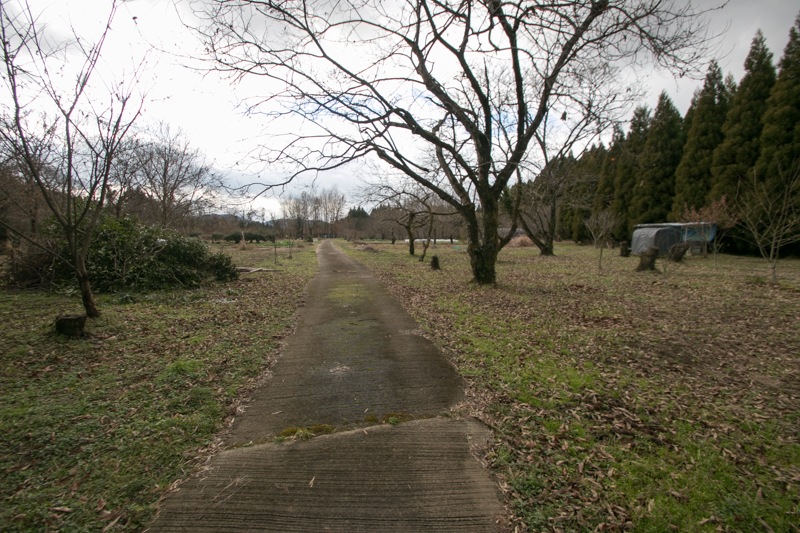 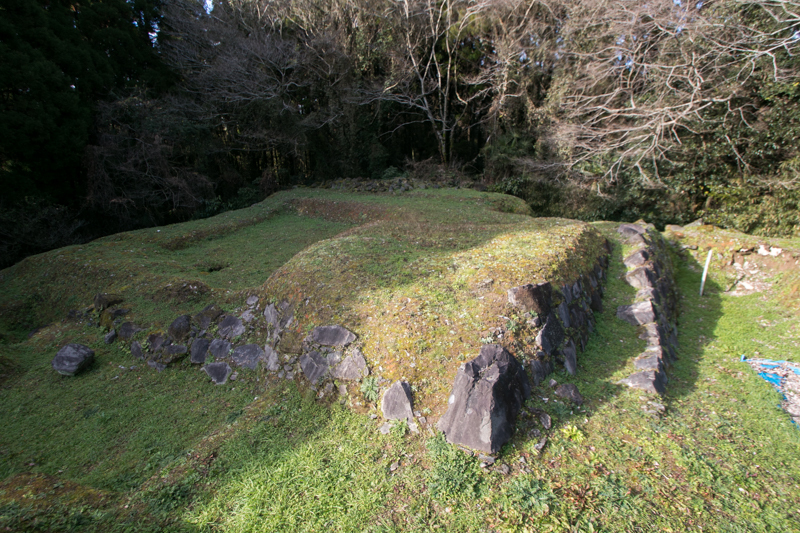 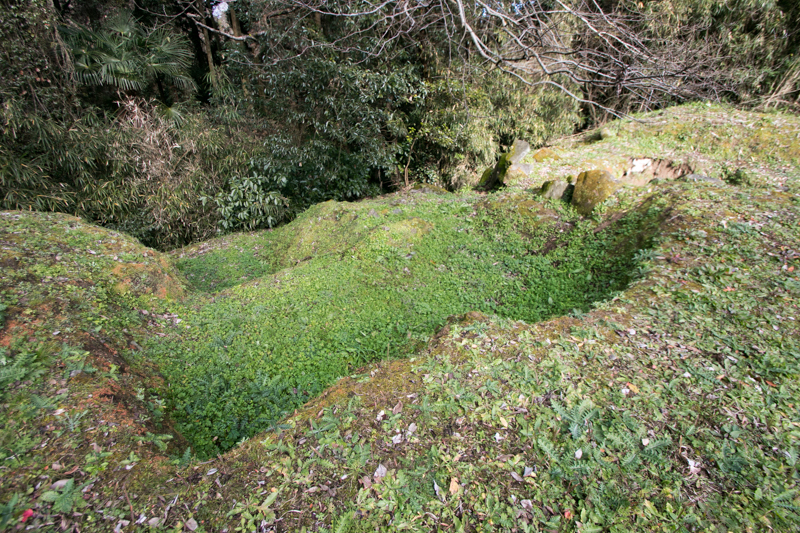 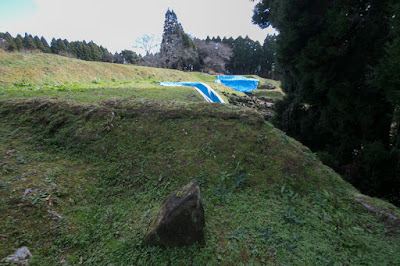 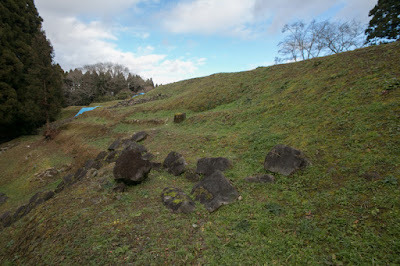 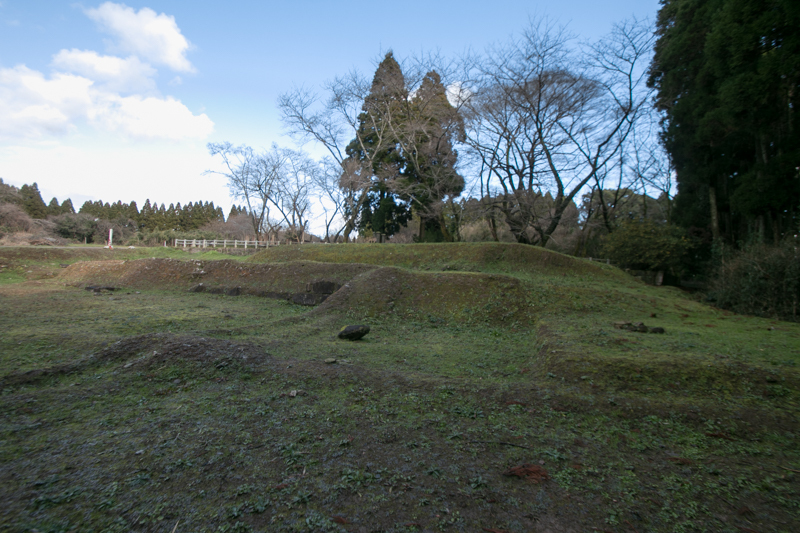 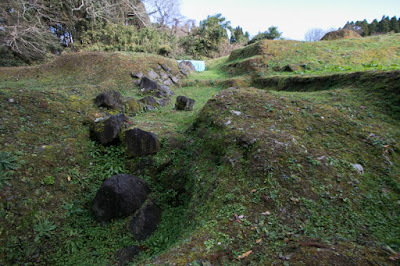 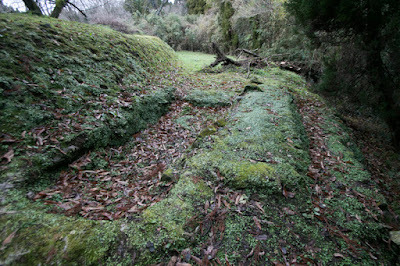 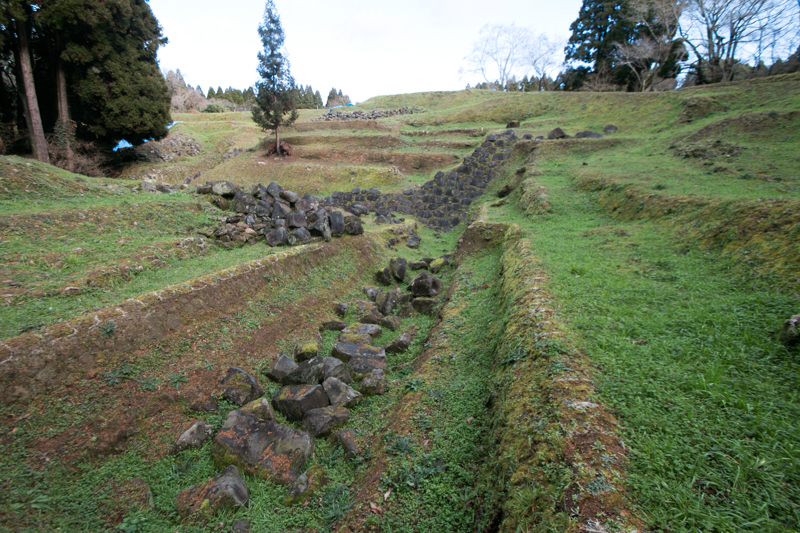 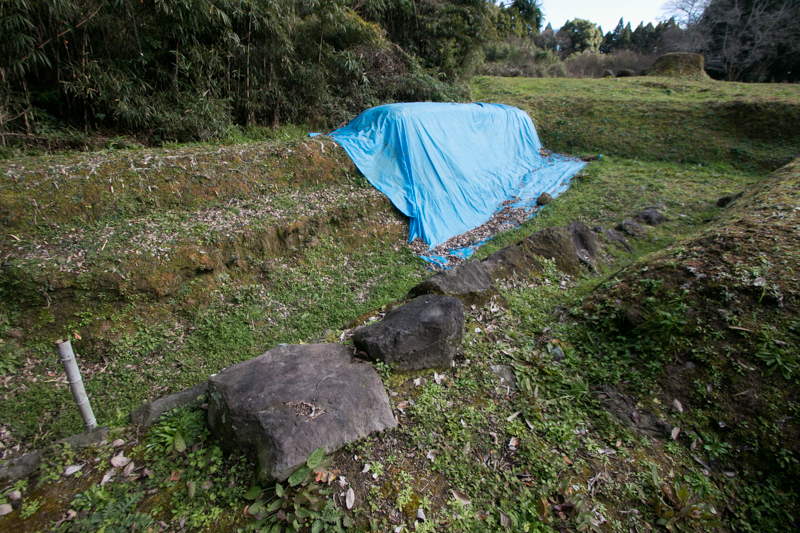 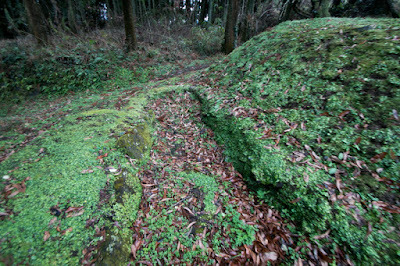 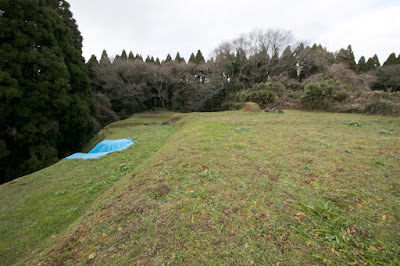 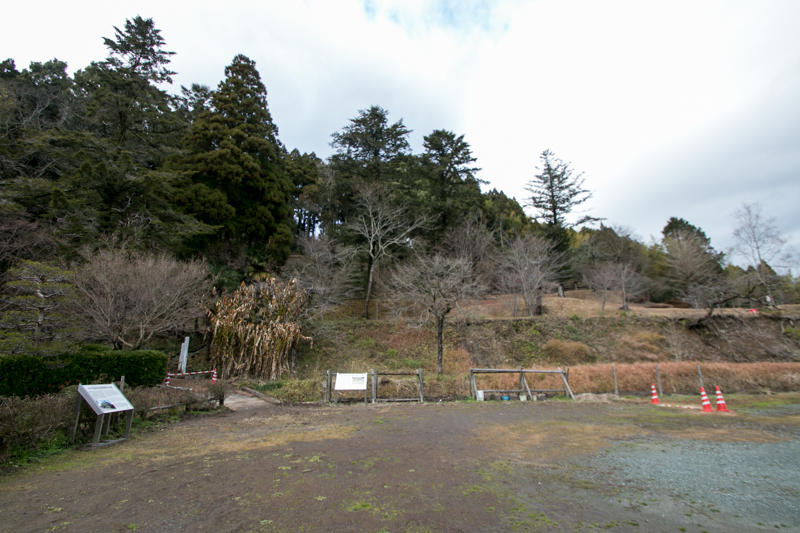 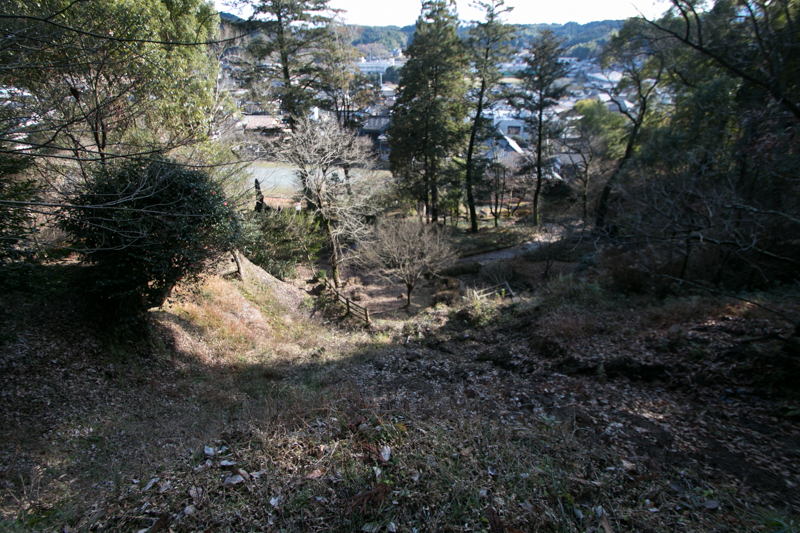 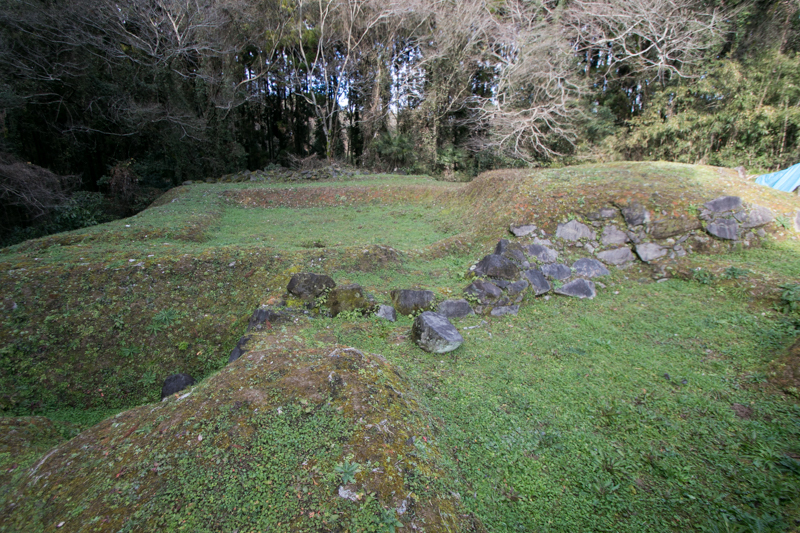 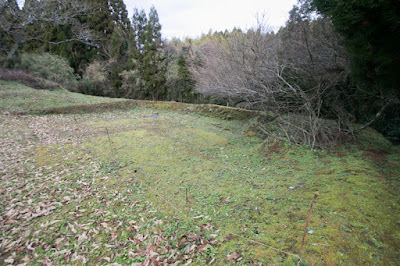 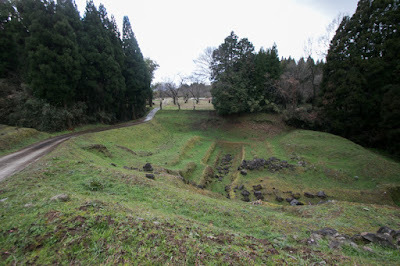 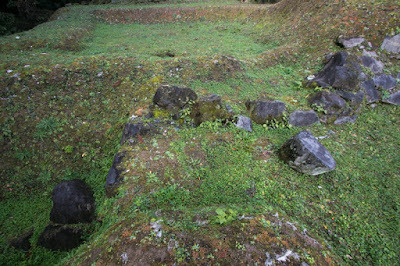 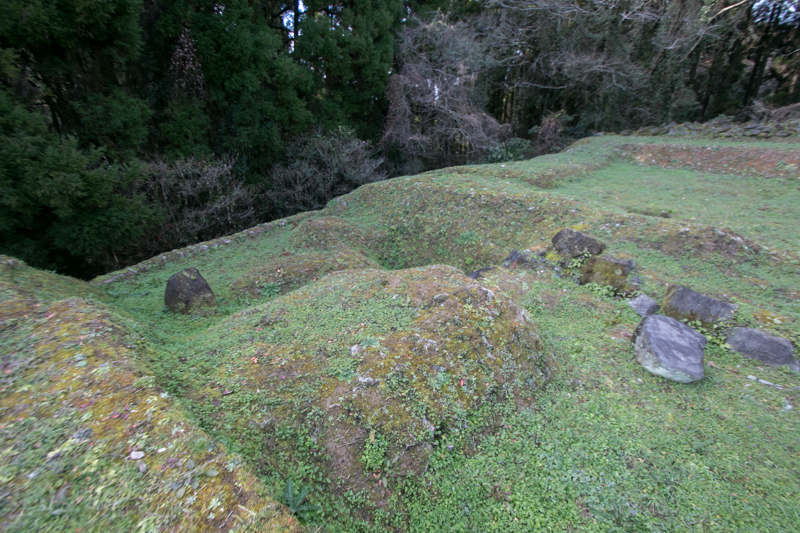 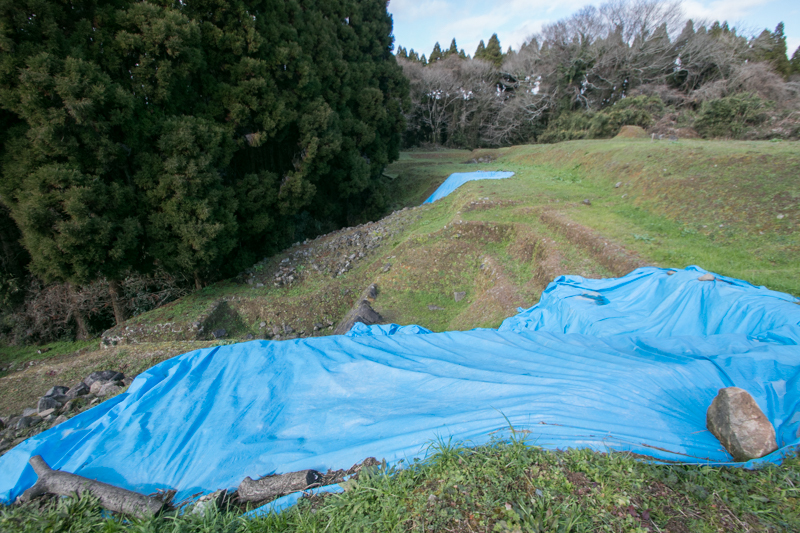 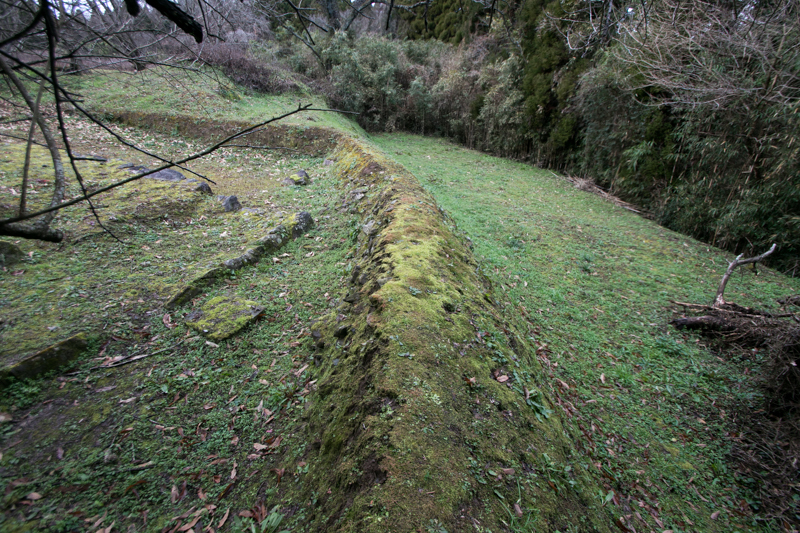 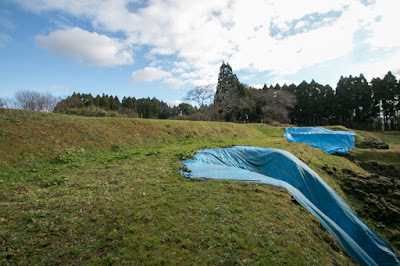 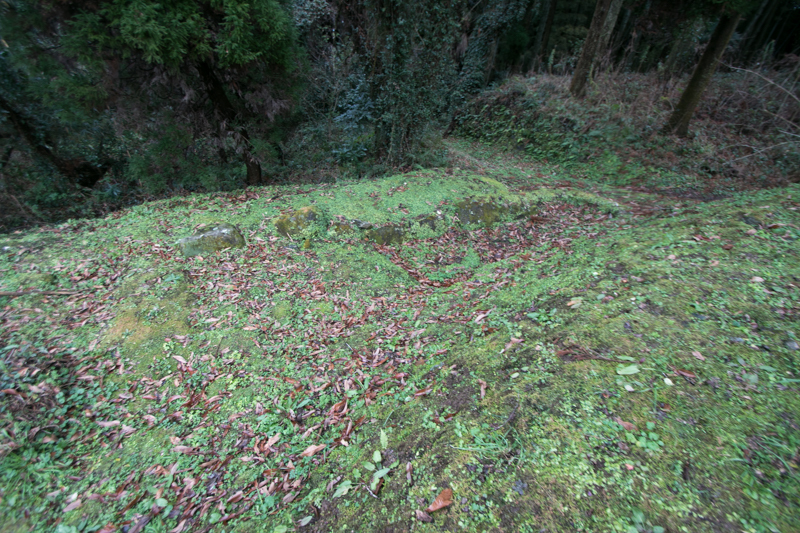 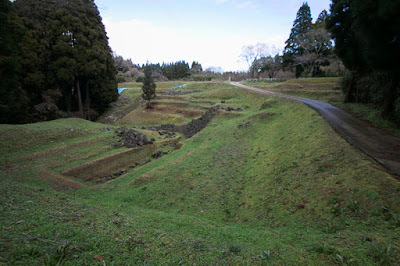 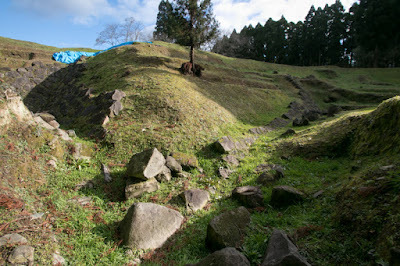 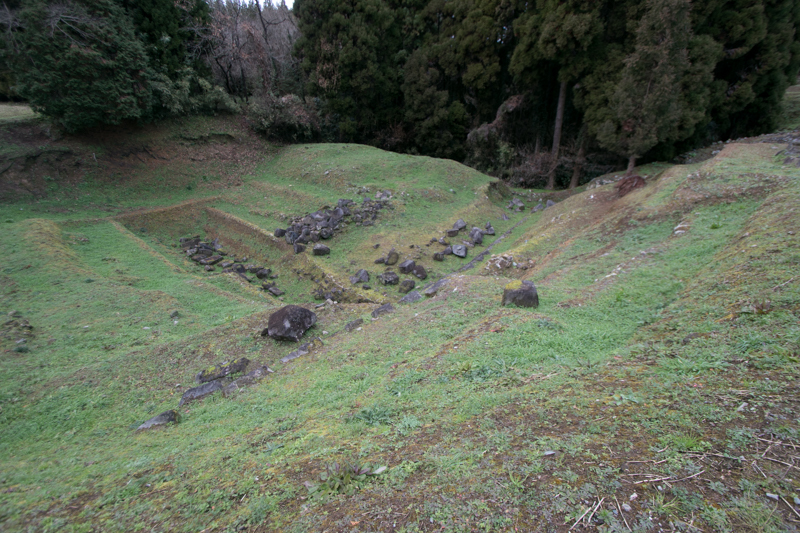 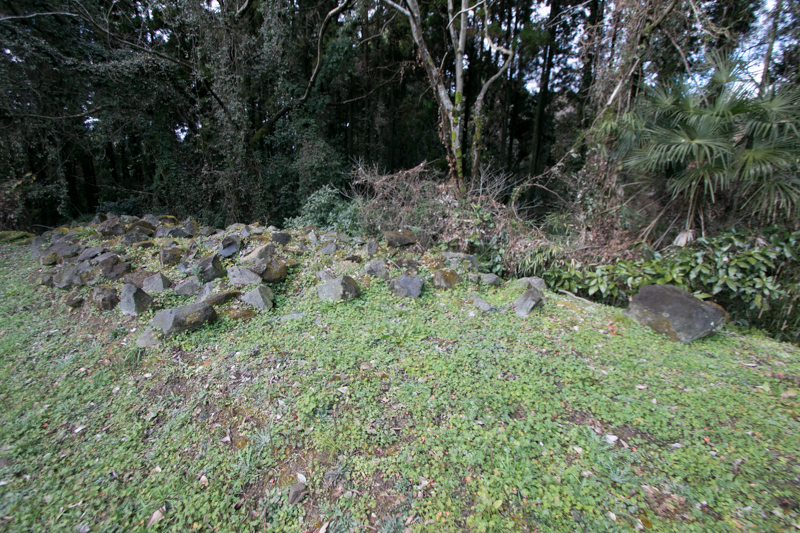 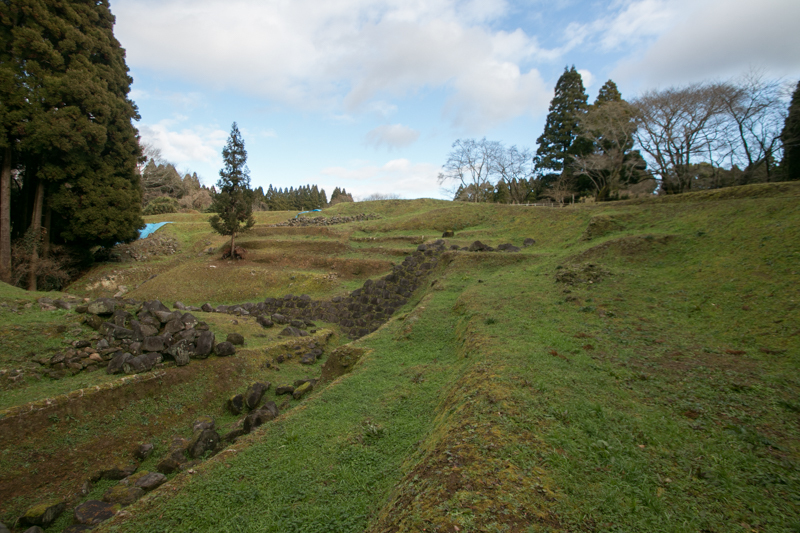 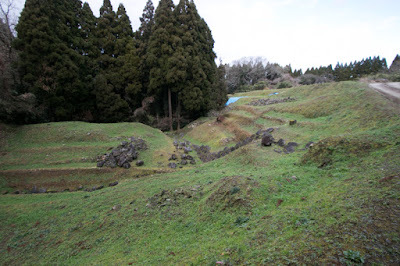 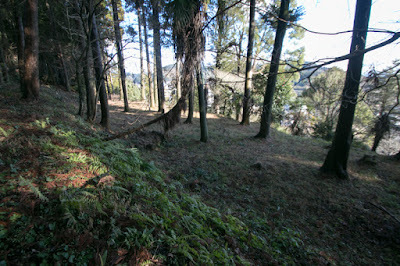 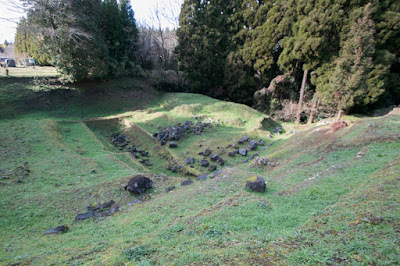 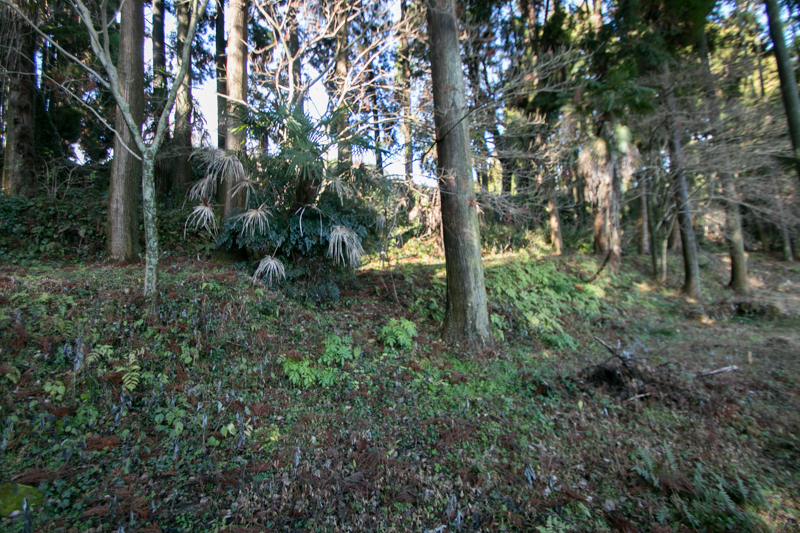 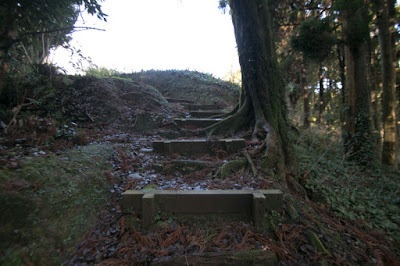 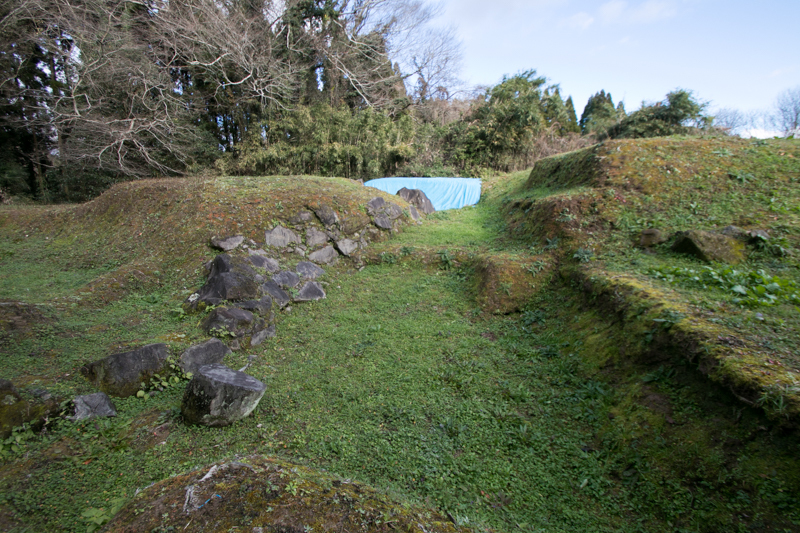 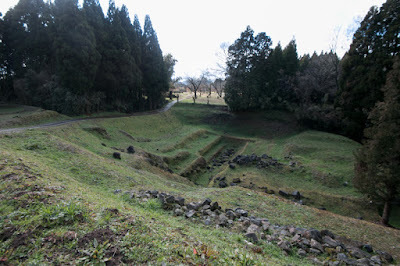 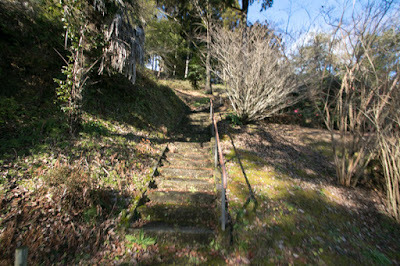 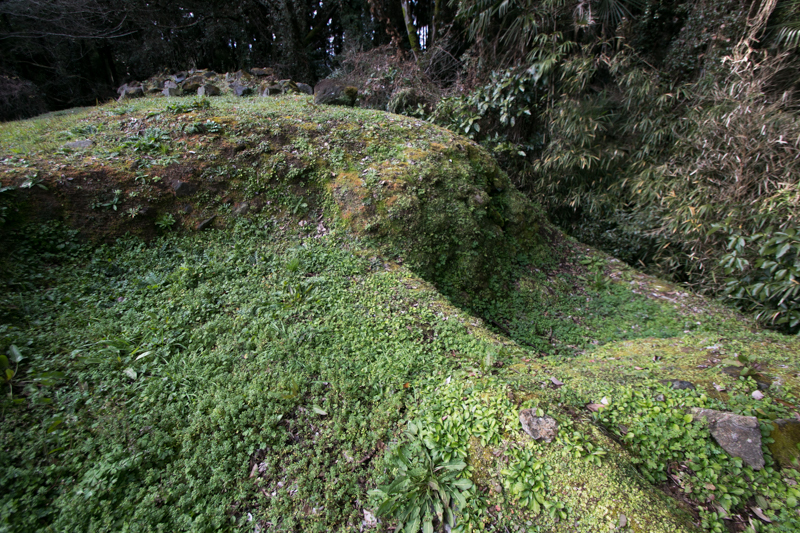 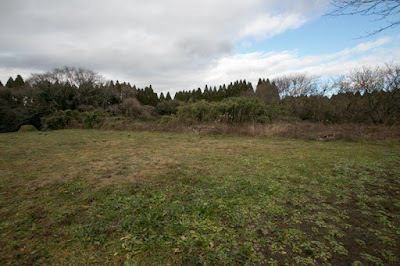 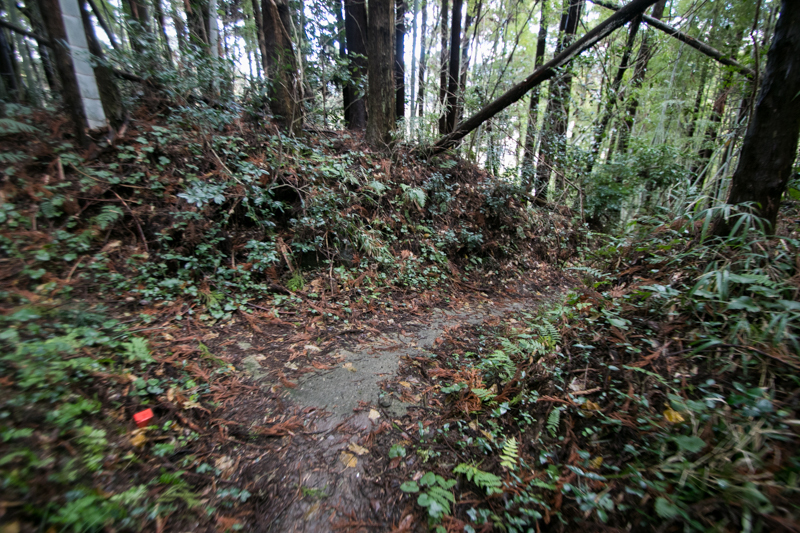 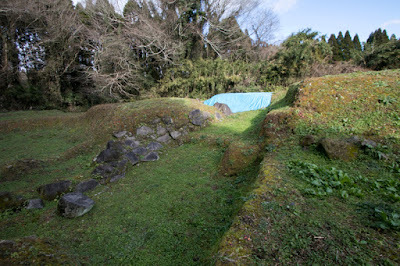 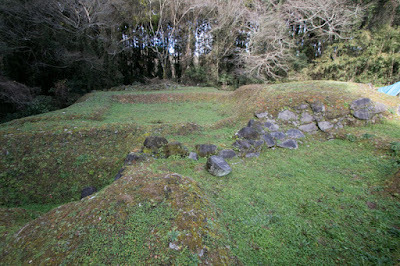 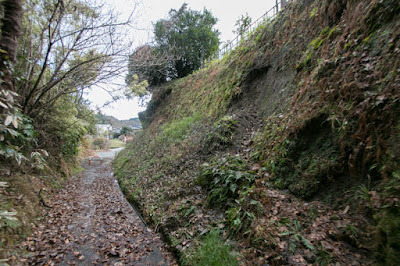 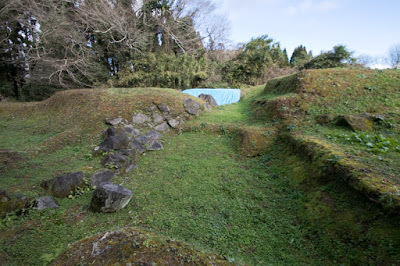 Central area of Nankan castle might be a 60 meter long square shaped area at the top of the hill, partially used as a tomb ground of Seinan Campaign. 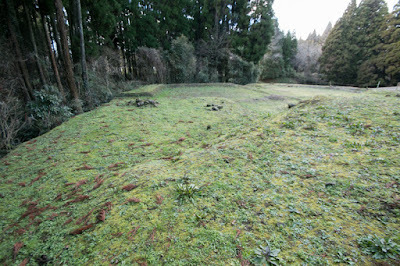 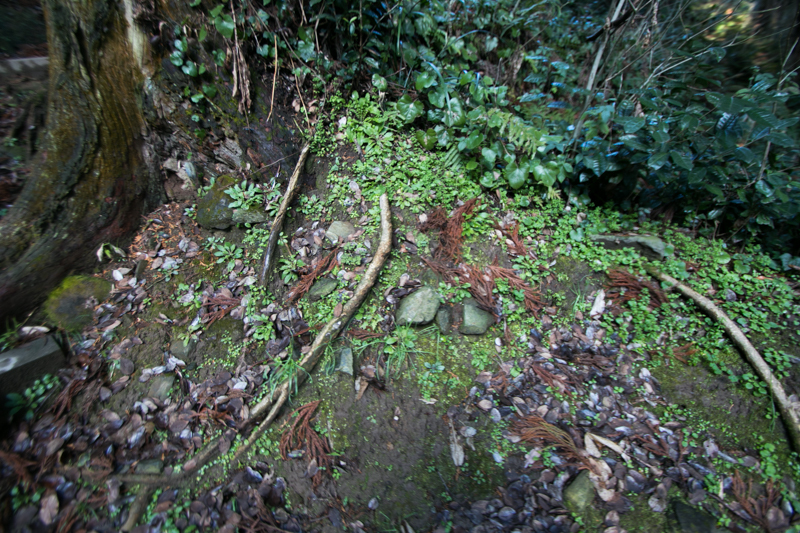 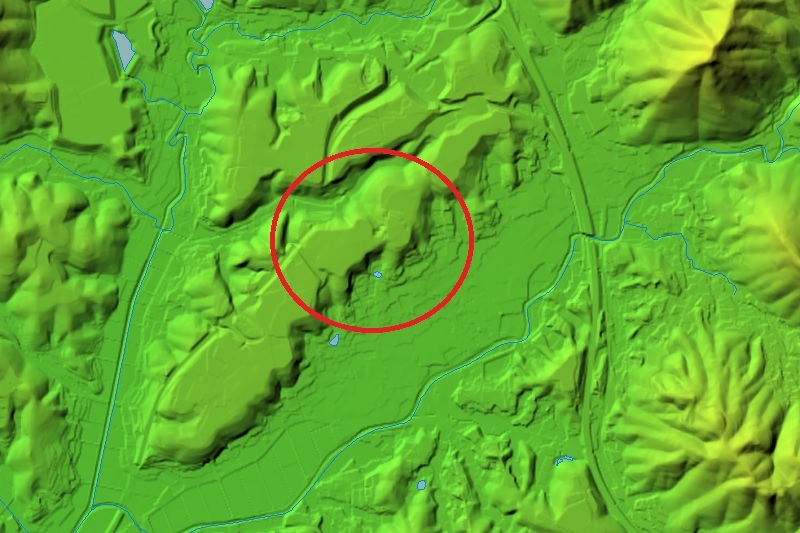 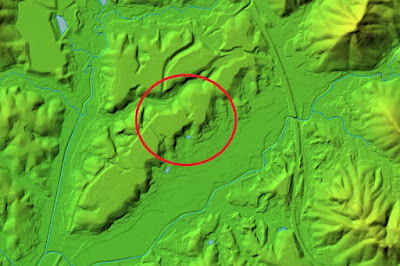 This area is separated by dry moat from secondary area at the north and third area at the west. 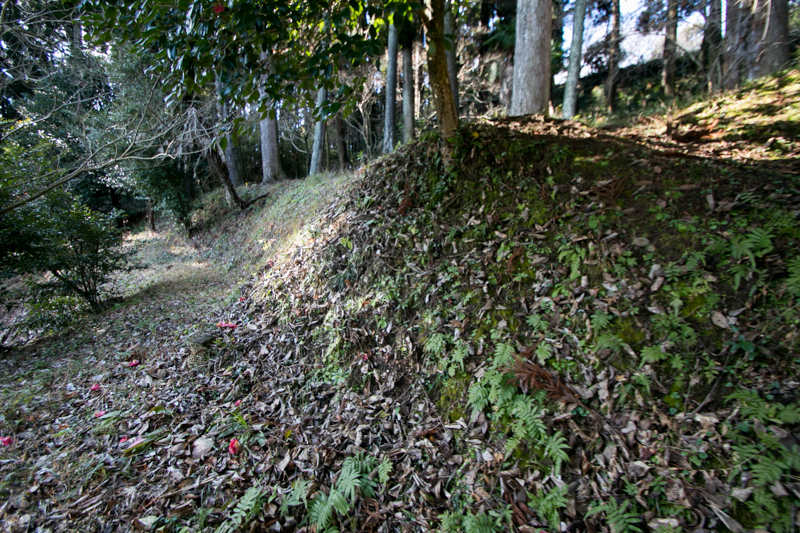 Especially the dry moat between central area and third area is a huge one utilizing natural valley, and might be intrusion point of enemy from hillside directly. 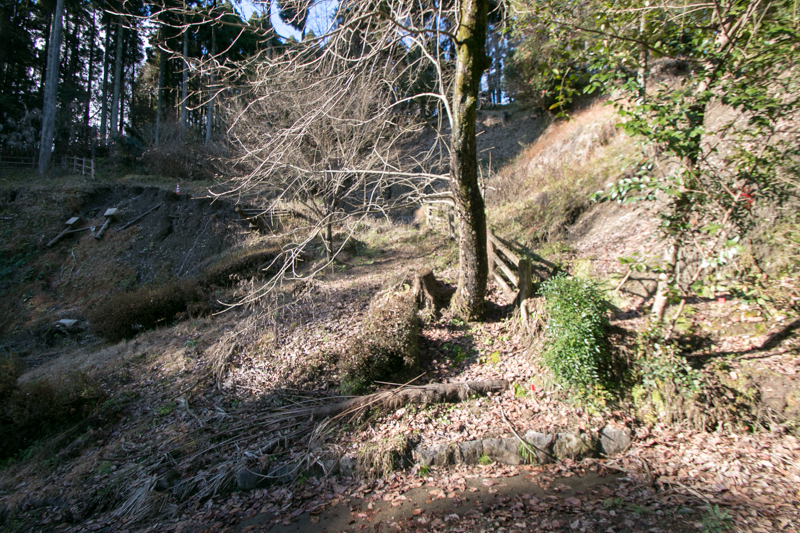 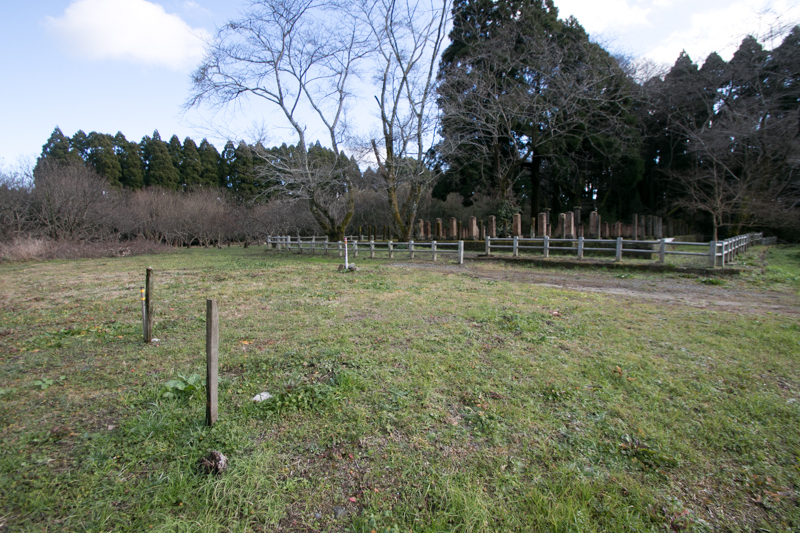 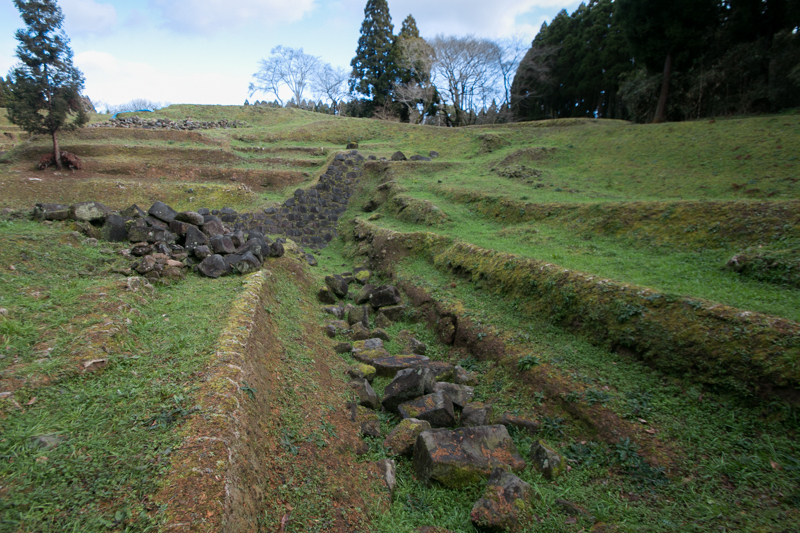 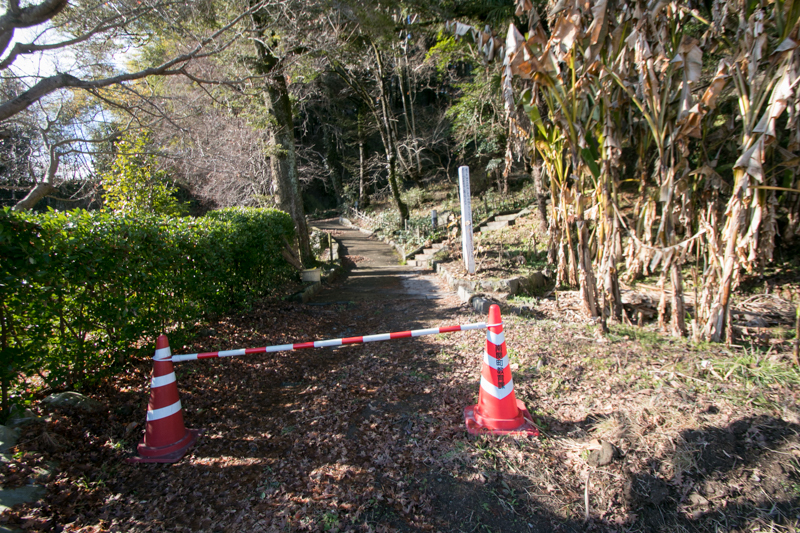 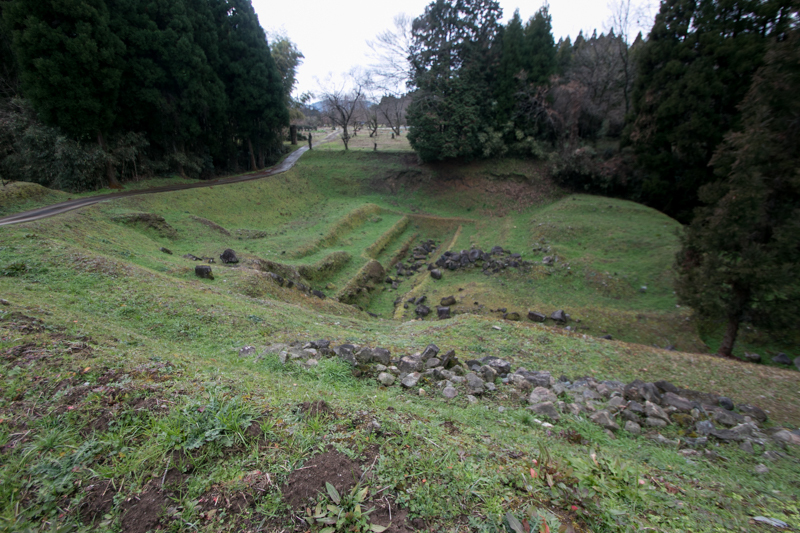 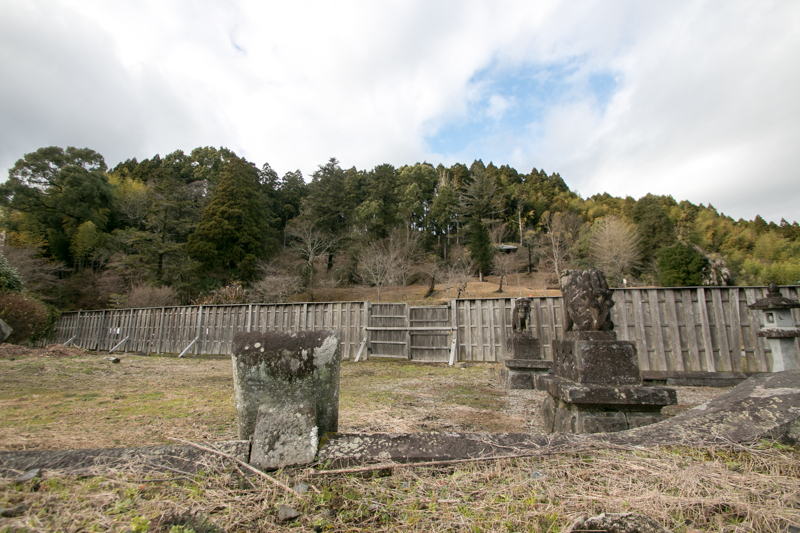 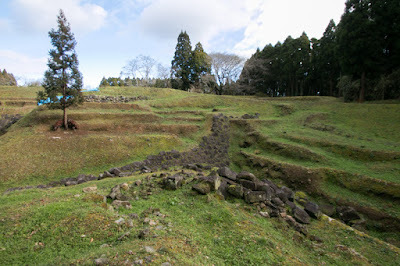 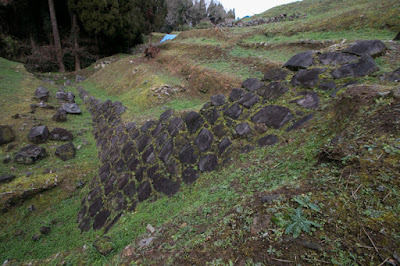 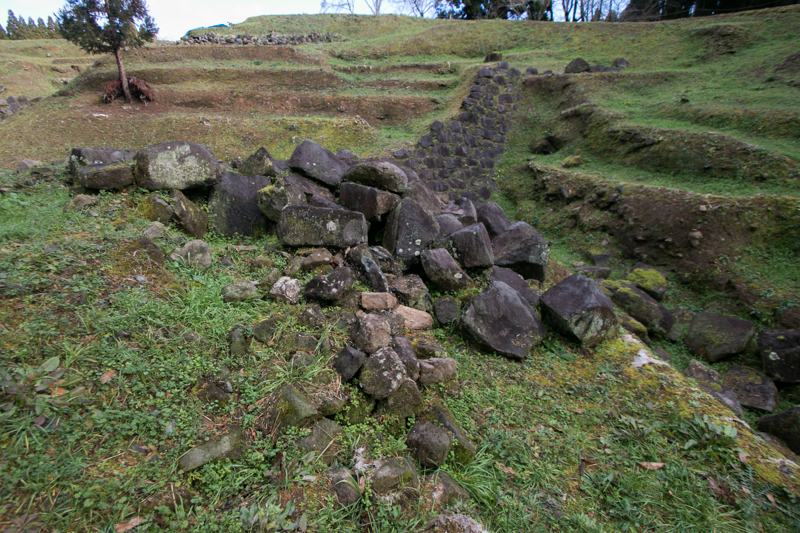 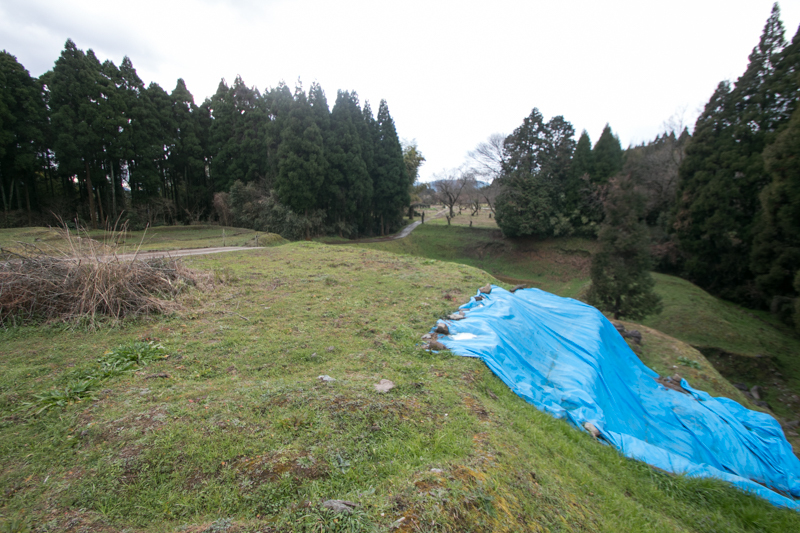 Because of this, western slope of central area is securely protected by tall stones originally exceeded 15 meter tall, which was covered by dark gray colored stones same as Kumamoto castle but severely destructed. It is unknown where main tower existed, but considering its planning it might be placed at northwestern corner, to fire both of secondary area and third area. 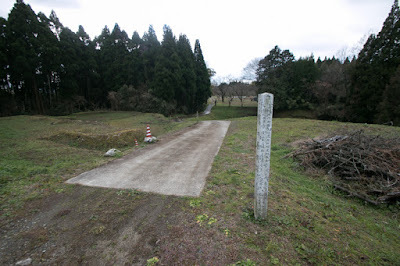 At the middle of eastern line there was the backside gate, which was a masugata style complex gate same as its front gate at western line. 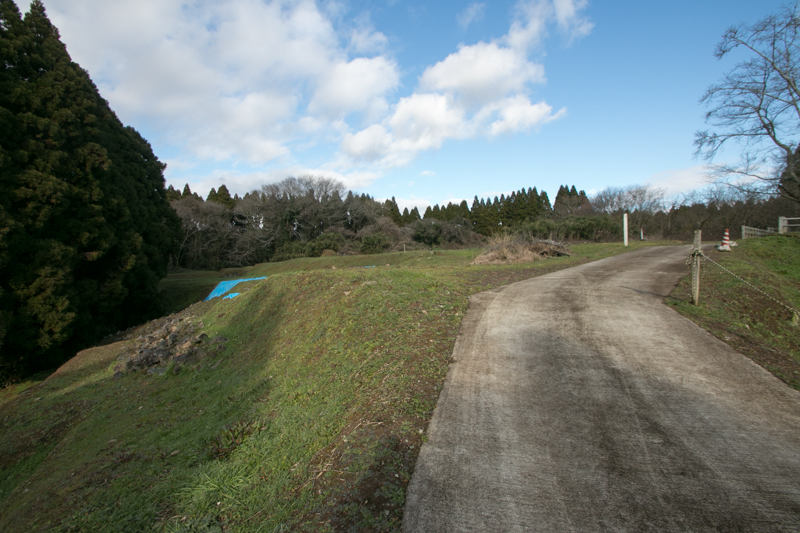 Secondary area is a rectangular shaped area of 60 meter long and 30 meter wide at the north of central area but can't enter now. Third area is a large area of 200 meter long and 150 meter wide ahead a clay bridge crosses 20 meter wide dry moat, and now used as a farming area. 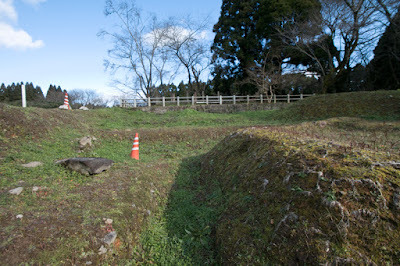 According to topographic map, tip of third area was also protected huge dry moat of 20 meter wide crosses the height. 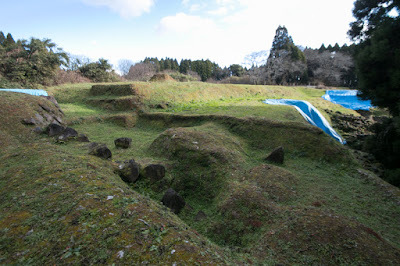 Total size of Nankan castle exceeds 90,000 square meter and outstanding large one among border castles of Kato clan. 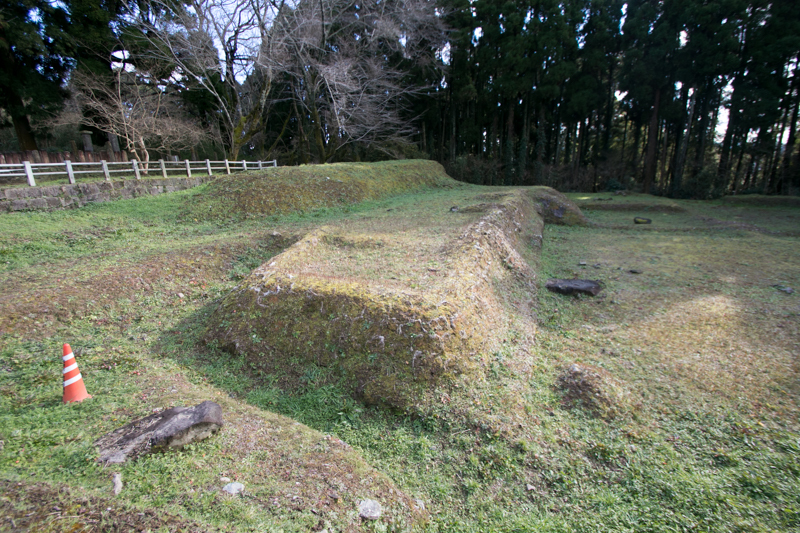 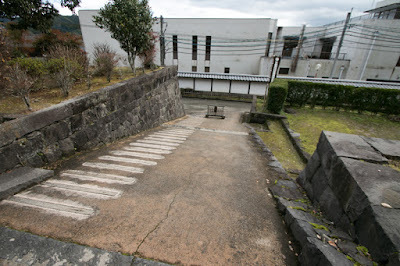 Kiyomasa shows his talent at castle building and irrigation, but died in ill 1613. 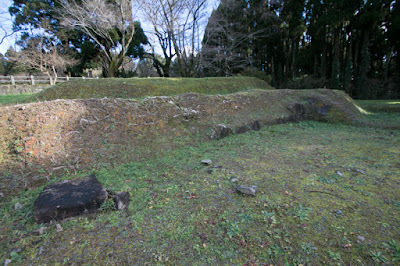 Hideyori Toyotomi lacked support of Kiyomasa was extinguished at the battle of Osaka castle in 1614 and 1615, and Kato clan itself was expelled because of internal conflicts in 1632. Nankan castle was abolished in 1615 under Ikkoku Ichijo Rei (one domain one castle rule) published in 1615, and was thoroughly destructed after the battle of Shimabara at 1638, to prevent reuse of abolished castle by rebellions. 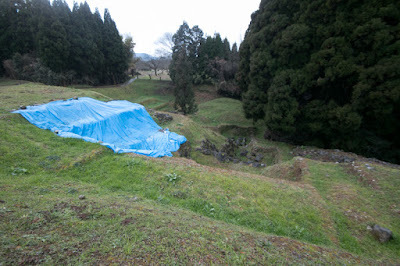 Stone walls were broken and thrown into dry moats, and were covered by sands then Nankan castle disappeared into the ground. 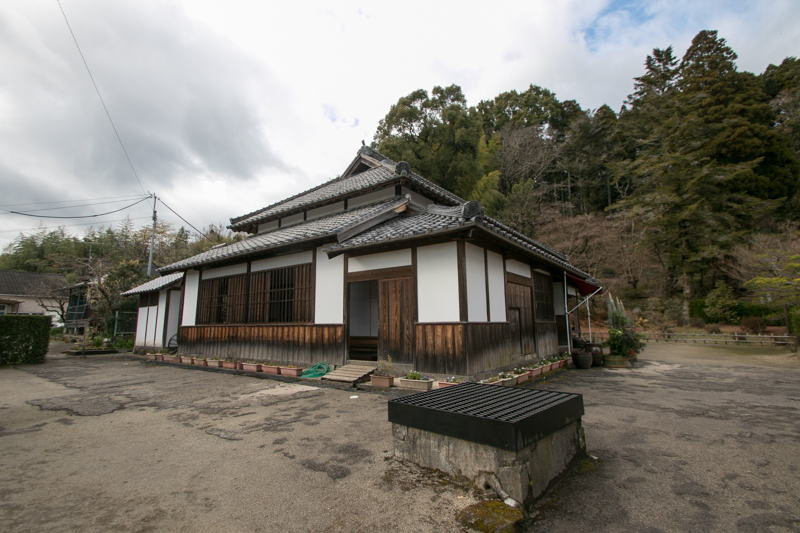 But the importance of Nankan area is unchanged then Nankan town prospered as a posting town of Buzen-Kaido road, and Hosokawa clan which succeeded Higo province placed their rest hose named "Nankan Ochaya" at the side of the castle. Nankan castle had lied long time in the ground, but recently investigation and excavation proceeds then former splendid shape is gradually revealed. 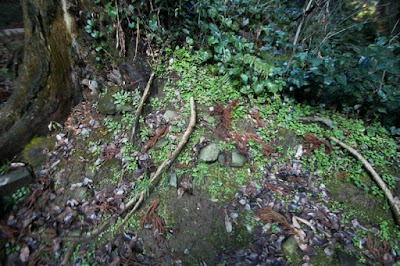 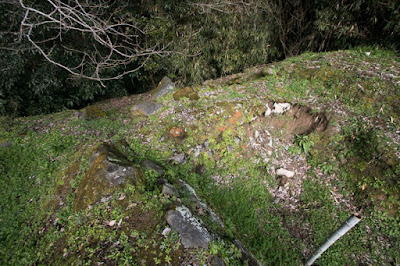 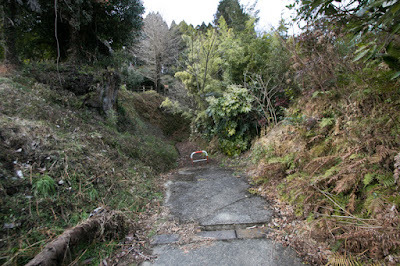 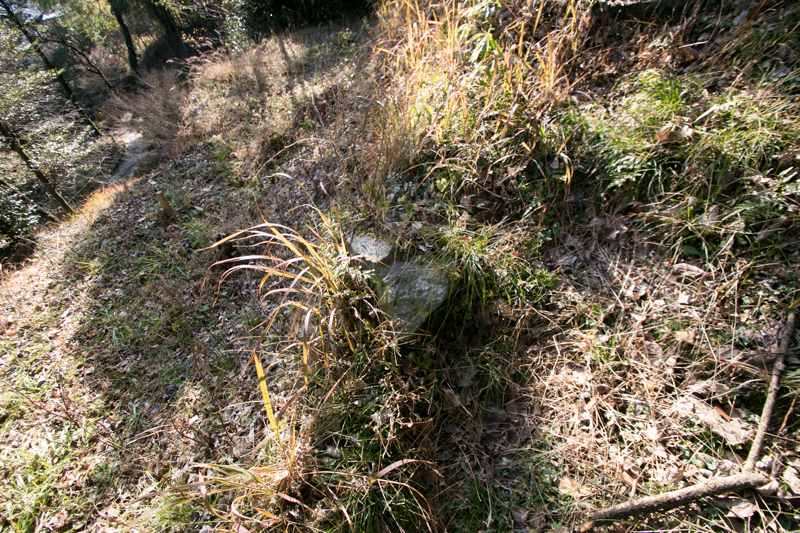 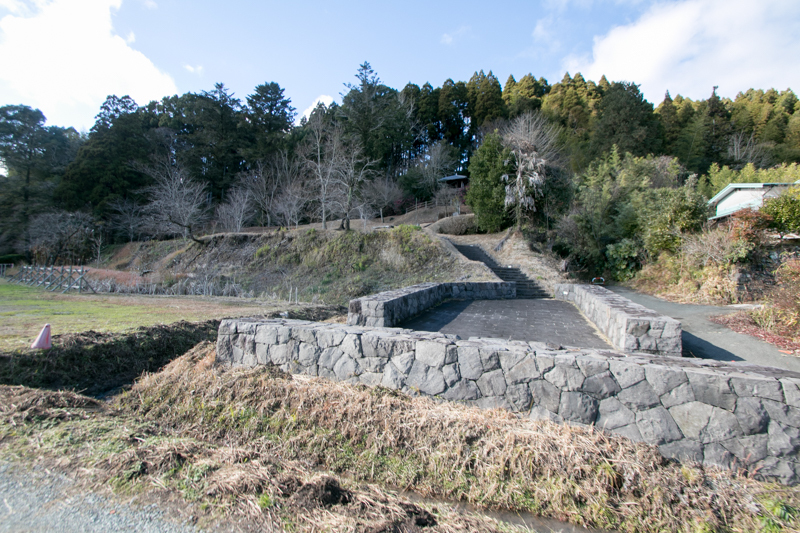 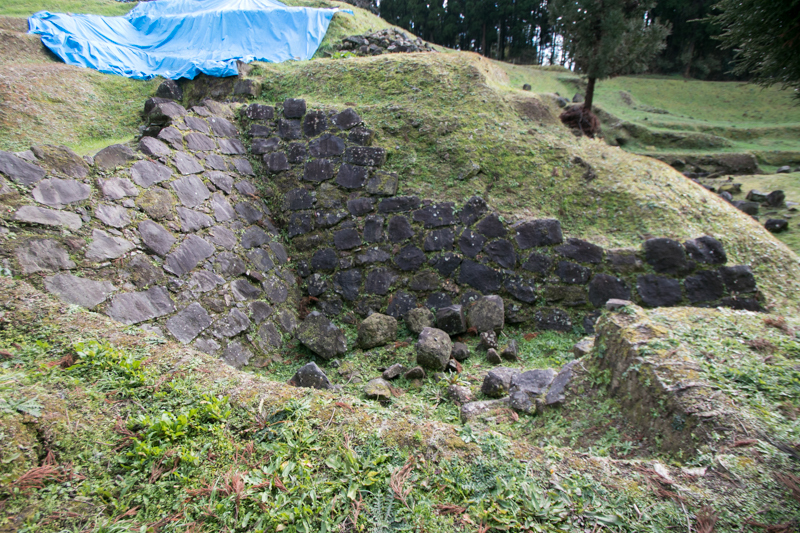 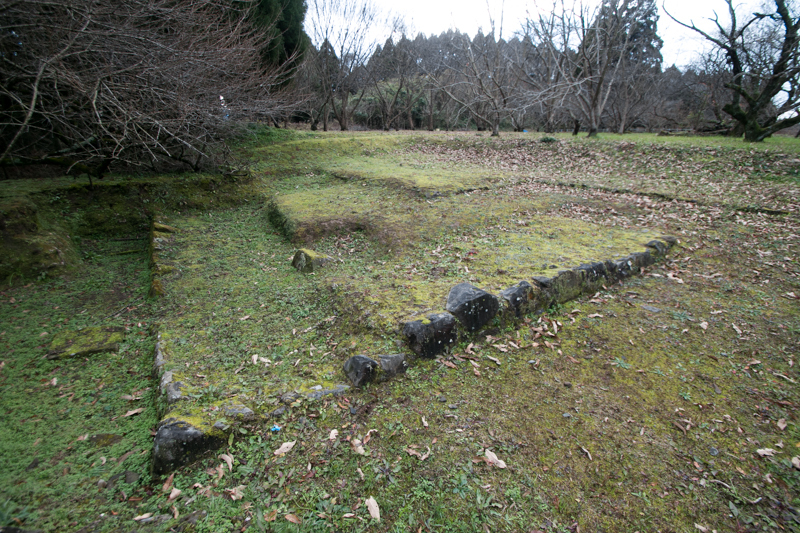 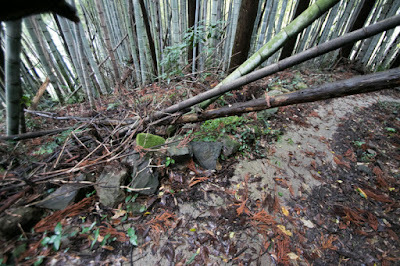 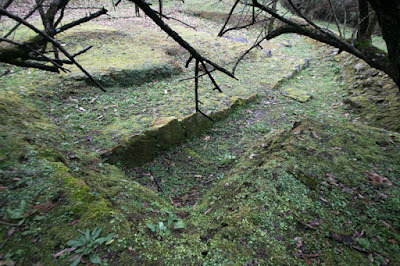 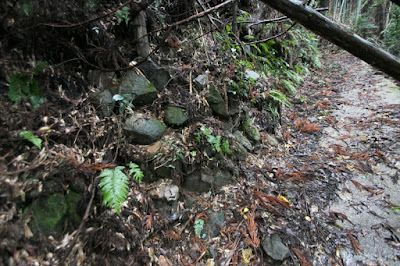 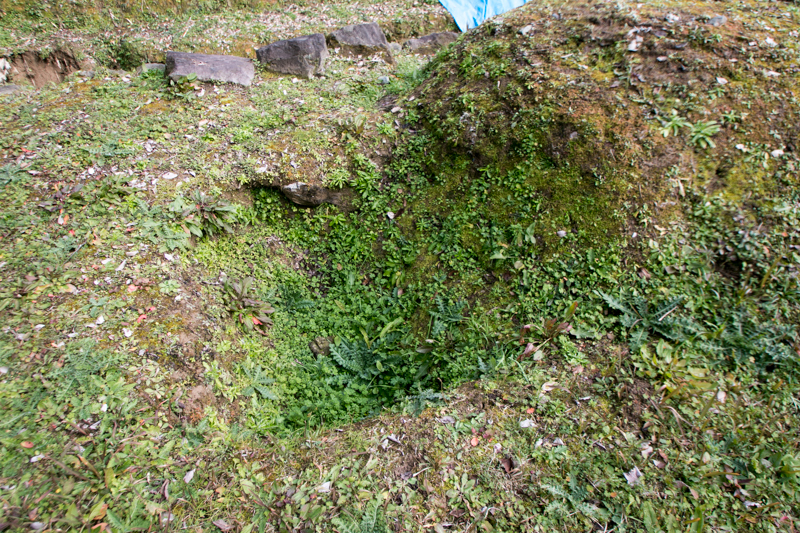 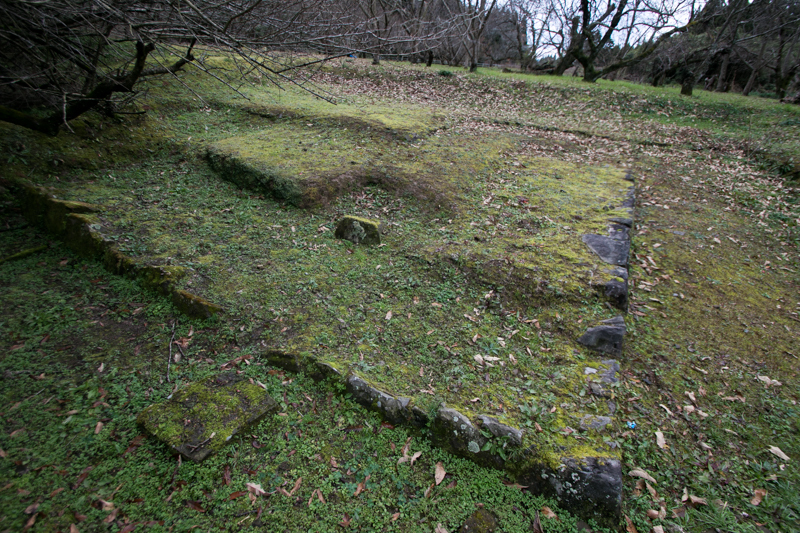 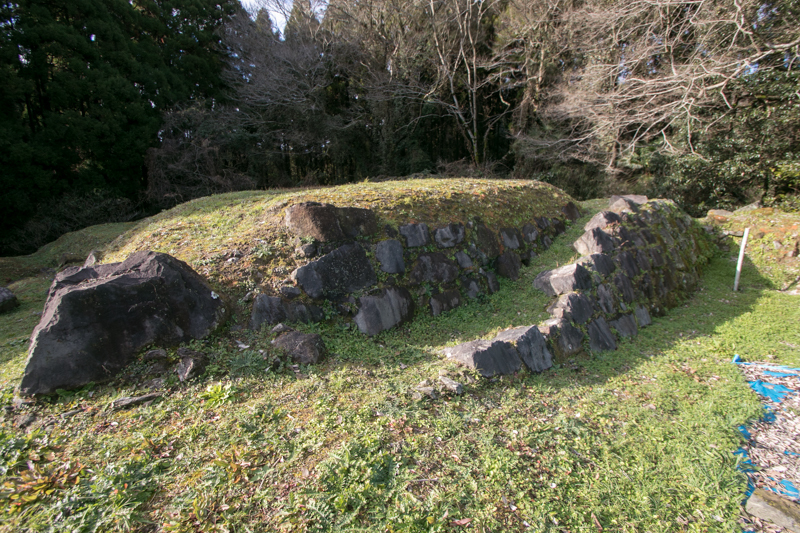 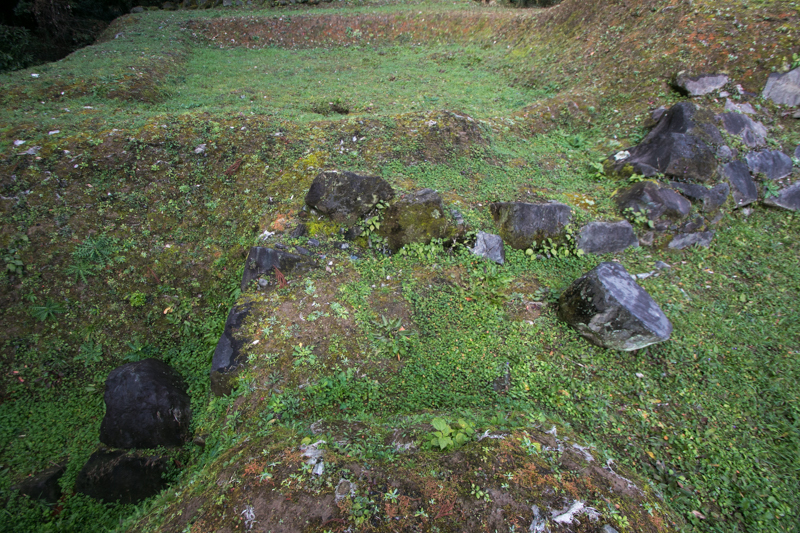 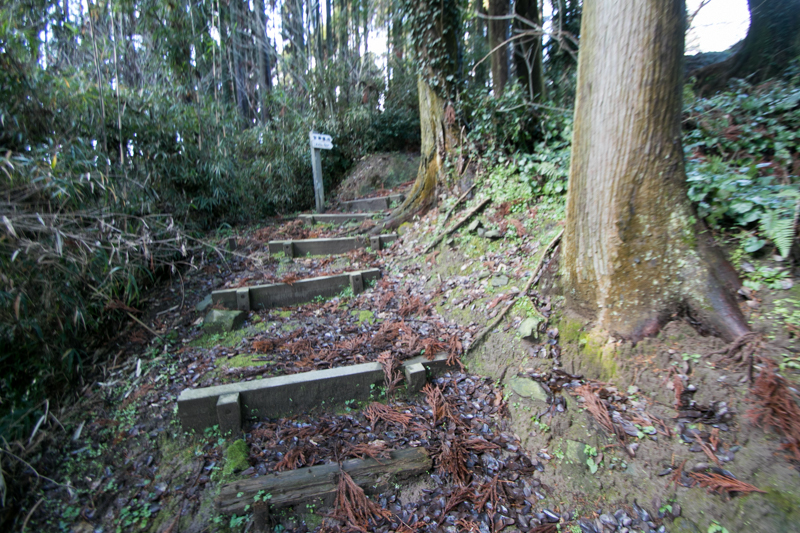 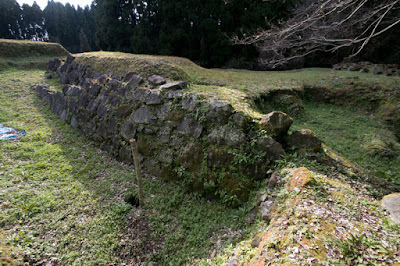 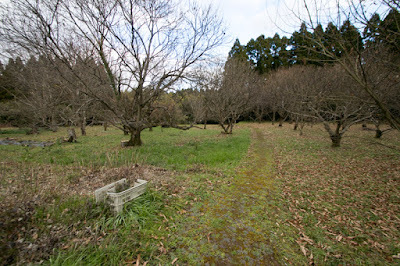 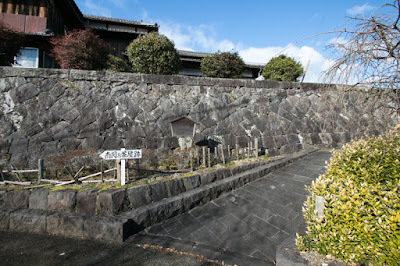 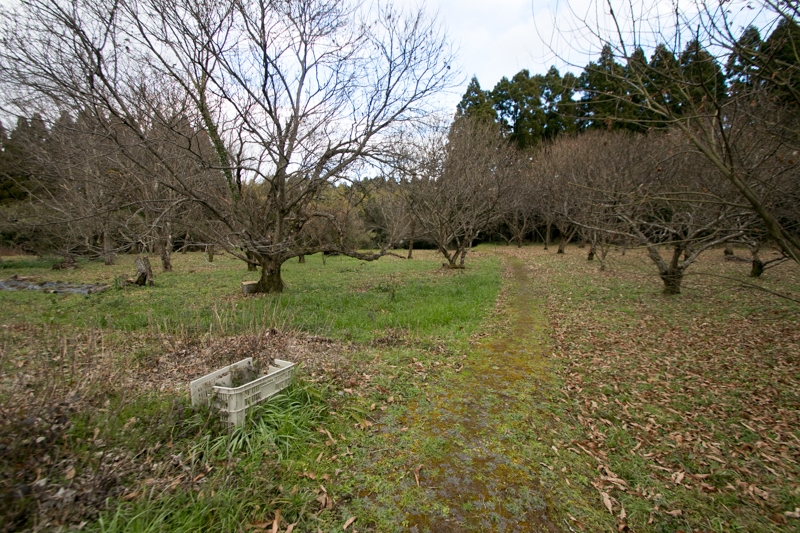 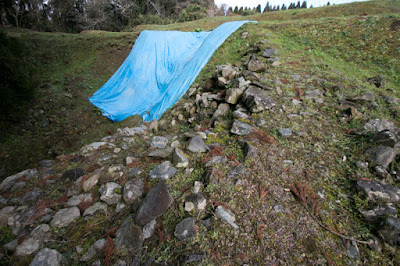 Only stones remain at basement layer or corner of stone walls, but it is sufficient to image former powerful shape of the castle of Nankan castle. 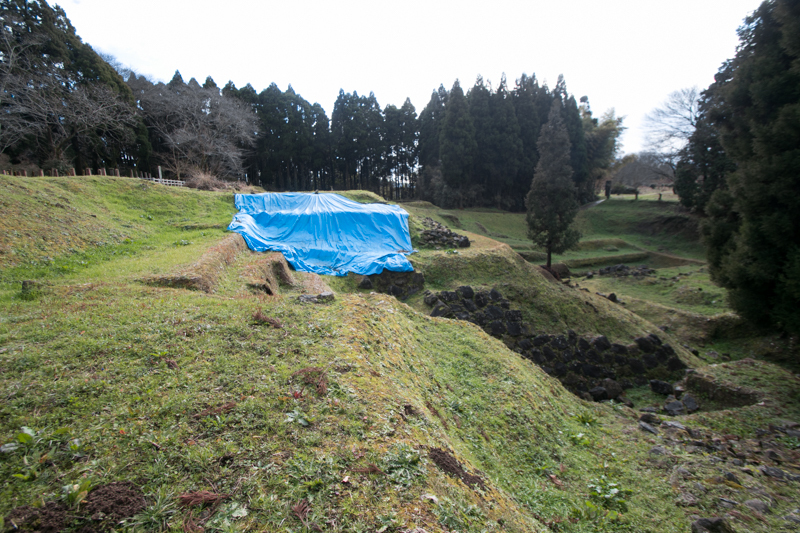 There might be budget limitation from recovery from earthquake or repair of Kumamoto castle, but it is hoped this castle reveals its whole shape in the future. 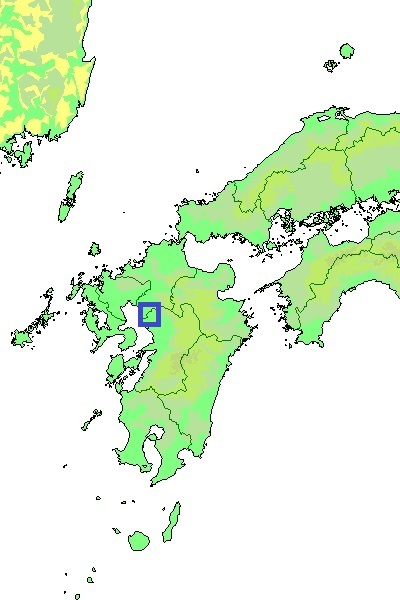 Bus from JR Kyushu /Nishitetsu Omuta station or JR Kyushu Tamana station to Nankan town. 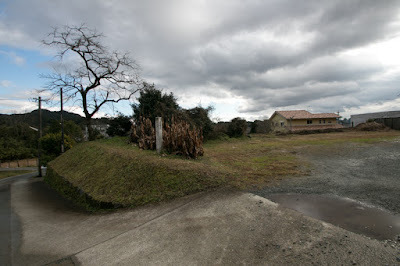 10 minutes drive from Kyushu Jidoshado Expressway Nankan interchange.